An inlet filled with sea ice around Venable Ice Shelf, as seen during an Operation IceBridge flight on Nov. 16, 2017. Photo: NASA/Nathan Kurtz. Two important studies on Antarctic ice shed light on how much progress scientists are making to predict the continent's future, and how little we really know. The threat: The first study, published on Jan. 30 in Science Advances, used synthetic aperture radar from satellites and aircraft to determine the motion and structure of the rapidly melting Thwaites Glacier in West Antarctica. If there were a "Most Wanted List" for glaciers, Thwaites would be No. 1. Scientists are desperately trying to determine its fate. Thwaites acts as a gateway to vast quantities of inland ice that rest on bedrock well below sea level. If ocean waters were to access that inland ice, it could all melt, raising sea levels by at least 10 feet. Geologist Richard Alley of Penn State University, who was not involved in the new study, called Thwaites a "geometric accident" that could lead to "large and rapid" ice loss if ice cliff instability that has happened elsewhere occurs there. "Cliff retreat is not some strange and unexpected physical process; it is happening now in some places, has happened in the past, and is expected wherever sufficiently high temperatures occur in [the] ocean or air around ice flowing into the ocean." Details: The study reports the ebb and flow of salty, dense and relatively warm ocean waters had taken a gigantic bite out of the base of Thwaites, leaving a gap between the glacial floor and the bedrock below. Its dimensions are staggering. The gap is 2.5 miles wide and 6 miles long, about 1,100 feet high and once contained about 14 billion tons of ice that have melted in the past few years. 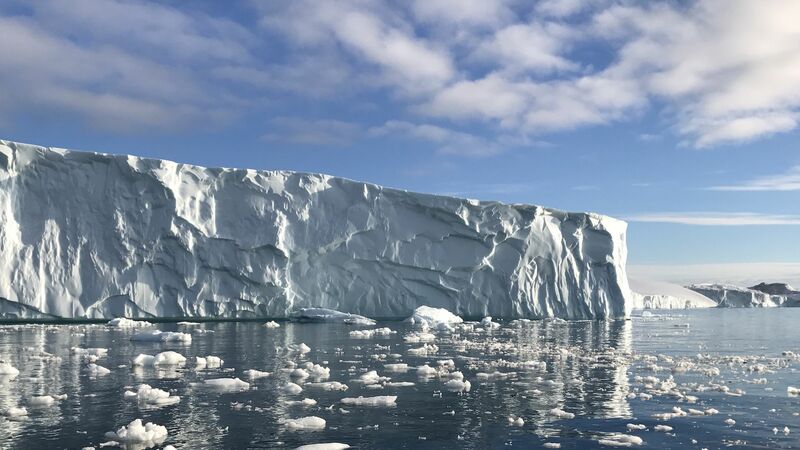 What they're saying: "What we are seeing with high resolution data is the ocean eating away large portions of the ice, taking big bites at a time instead of eroding slowly," UC Irvine's Rignot, a co-author of the new study, told Axios. A second study on West Antarctic glaciers including Thwaites was published on Wednesday in Nature, scrutinizing the alarming findings of another study published in 2016. That study showed that marine-terminating glaciers become inherently unstable when their calving front forms tall cliffs, upwards of 330 feet tall. This marine ice-cliff instability causes such glaciers to rapidly break apart. Observations of this physical process in Greenland's outlet glaciers have lent credence to this hypothesis. The catch: The new research uses statistical techniques to find that past episodes of rapid sea level rise could've happened without this ice cliff instability. The study suggests sea level rise will be lower than the numbers the 2016 study put forward, projecting only a 5% chance that the Antarctic contribution to sea-level rise will top 15 inches by 2100. "Our study demonstrates that the jury’s still out on marine ice-cliff instability," study lead author Tamsin Edwards, a geographer at Kings College in London, told Axios via email. Rob DeConto of U-Mass Amherst, who co-authored the 2016 study, said the new study is useful but does not rule out the more alarming possibilities. "I don't really see ice fracture as an optional process that can be excluded from ice sheet models," DeConto told Axios. "Ice that flows into the ocean essentially always ends in a cliff regardless of the setting or spatial scale." Richard Alley, a geoscientist at Penn State University who was not involved in either of the new studies, told Axios that marine ice-cliff instability poses a grave danger. The bottom line: More work is needed for scientists to confidently winnow down the forecast range of sea-level rise. A new, multiyear U.S.-British research campaign focused on Thwaites should help.